Alice Paton joined the team in 2015 as a receptionist. 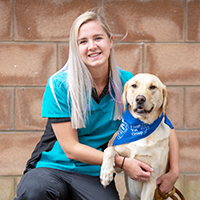 In August 2016 she started her training to work towards becoming a registered veterinary nurse, she is almost there! She currently lives in Dundee. In her spare time she enjoys playing netball and socialising with friends. You will mostly see Alice in our St Andrews or Newport branch.